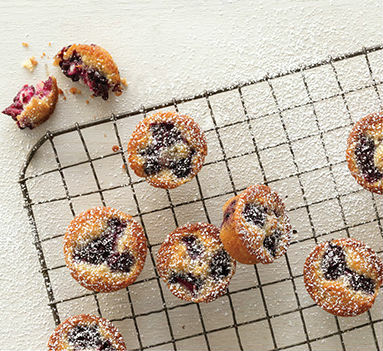 These little bite size blackberry and honey financiers, French muffins, are perfect for a special morning treat or a delicious addition to a weekend brunch. Give this tasty recipe a try with our Honeyland Clover honey. Melt butter in a medium saucepan over medium heat. Simmer until browned bits begin to form. Continue to simmer, frequently scraping up browned bits at bottom of pan, until fragrant and dark brown but not burnt, 6-7 minutes. Scrape butter and all browned bits into a medium bowl. Let cool for 3-4 minutes. Meanwhile, process almonds and flour in a food processor until nuts are finely ground. Transfer to a medium bowl; whisk in 1 1/2 cups plus 2 tablespoons powdered sugar. Add egg whites; mix until smooth. Fold in Clover Honey. Arrange a rack in middle of oven; preheat to 375°F. Coat muffin cups with nonstick spray. Pour 1 generous tablespoon batter into each prepared muffin cup. Top with 3-4 blackberry halves. Bake until cakes are golden brown and just cooked through, 15-16 minutes. Let cool in pan for 10 minutes. Remove cakes from pan. Serve warm or at room temperature. Dust with powdered sugar just before serving.